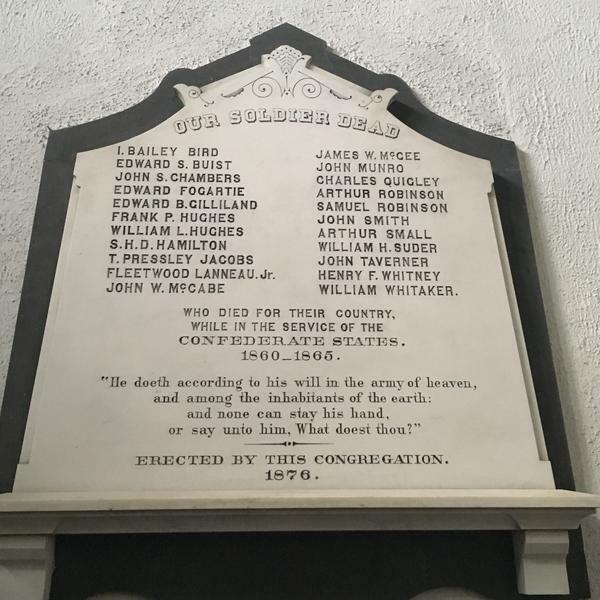 A plaque at the main entrance of Second Presbyterian Church in Charleston, S.C., memorializes Confederate soldiers from the congregation who died during the Civil War. People line up to enter for Sunday service at the Emanuel AME Church in Charleston, S.C.
A woman reads a program during a memorial service remembering the victims of the mass shooting at Emanuel African Methodist Episcopal Church. 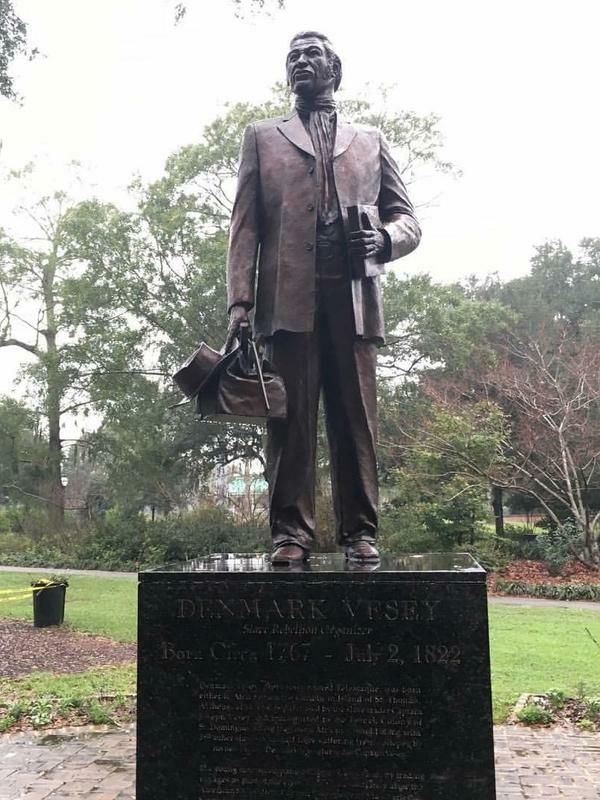 A statue of preacher Denmark Vesey, hanged for planning a slave rebellion, stands in Charleston's Hampton Park, named for an avowed white supremacist. In the summer of 1822, Denmark Vesey planned to destroy Charleston, S.C. He had been born into slavery in the Caribbean and brought by his owner to the United States, where he purchased his freedom for $600 in lottery winnings. But Vesey could not secure the emancipation of his wife and children, as South Carolina changed its laws in 1820 to effectively prohibit the owners of enslaved people from setting them free. By the time those laws were changed, Vesey had become a preacher and leader at the African Church, a congregation of free and enslaved black people that boasted a membership in the thousands. The church had found ways to quietly resist slavery, so it was always in peril, subjected to raids by the city's suspicious white leaders. Vesey led weekly prayer meetings in his home, but he preached only from the Old Testament, and lingered on Exodus, where God would deliver his people, and those who had held them captive would be punished with death. Vesey planned an audacious insurrection involving thousands of black people in the Charleston area, free and enslaved, whom he had quietly recruited. They would raid the city's arsenals and burn the city to the ground. It was to be the largest, bloodiest slave revolt on American soil. But another member of the African Church told his master about the plot, and Vesey and his fellow conspirators were rounded up, tried, convicted and hanged. The African Church was burned to the ground. The thwarted rebellion terrified Charleston's white leaders and slave owners, who moved to outlaw black churches and forced the African Church's congregation to worship for decades in secret. After Emancipation in 1865, the congregation formally reassembled. Vesey's son was said to be among the people who helped build their new house of worship that the congregants called "Emanuel," which means, "God with us." 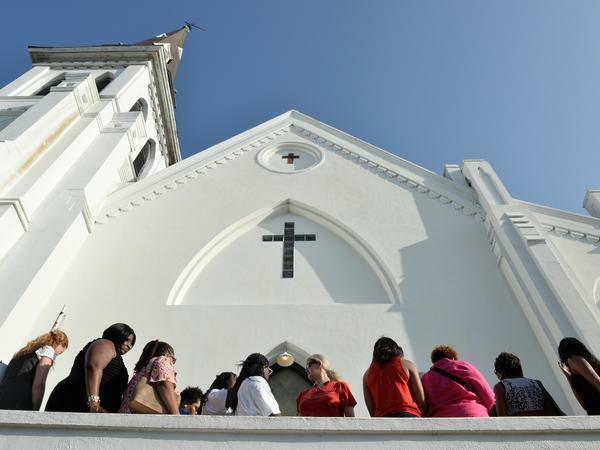 But to the folks in Charleston's black community, it was known affectionately as Mother Emanuel. 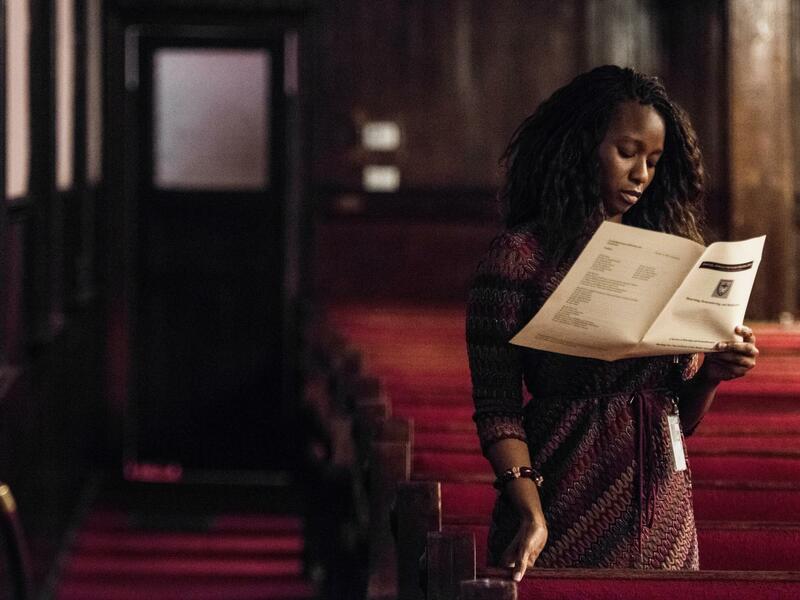 Faith and race play big roles in the history of Charleston. In the stories the city tells itself about itself, Charleston joyfully celebrates the former, and rather impressively obfuscates the latter. That unacknowledged history coursed through the murder trials of Dylann Roof and former police Officer Michael Slager this month. The cases were different in important ways and ended that way — Slager's jury couldn't reach a verdict; Roof was convicted. But both came to be shaped by the politics of forgiveness, in which each case could be treated as tragedies that existed outside of any history that required acknowledgment. On the evening of June 17, 2015 — nearly 193 years to the day of Vesey's planned rebellion — avowed white supremacist Roof went on a shooting rampage at Mother Emanuel, killing nine people as they gathered for Wednesday night Bible study. In the days after his arrest, several relatives of the victims spoke at his bond hearing, and did so with uncommon grace. Some even invited him to Bible service. "I acknowledge that I am very angry," Bethane Middleton Brown, the sister of one of the victims, said at the hearing. "But one thing that [my sister] always enjoined in our family ... is she taught me that we are the family that love built. We have no room for hating, so we have to forgive." The coverage of the Emanuel shooting was quickly framed around such gestures of mercy and became linked, by geographical proximity, to Slager's fatal shooting of Walter Scott just a few months prior. In that story, too, Scott's family was drawn into a public role, and grief imbued its calls for calm, peace and forgiveness with particular moral heft. "So many are engaged in a search for evidence of their victimization in order to justify their anger," Michael Gerson, a former speechwriter for George W. Bush, wrote in the Washington Post. "Here, genuine victims of a horrible crime responded with mercy." It was hard not to read into sentiments like Gerson's a tacit scolding of black protesters, perhaps even black anger more broadly, in other cases. The sincere outpouring of grief and solidarity after the church massacre — thousands of people showed up, somewhat spontaneously, and linked hands across the span of a major local bridge — seemed to bolster a notion that Charlestonians had responded to the tragedy at Mother Emanuel in the right way, without angry protests or unrest. To some critics, who were careful to acknowledge the strength displayed by the grieving relatives, the story of forgiveness and racial comity forming around the shooting seemed like a play at cheap grace. Roof, a monster, possessed of a kind of racism that was easily condemned. But where, they wondered, was that same solidarity around the kind of institutional inequalities, like the ones raised in the case of Slager, that might have far-reaching societal implications? What did personal forgiveness have to do with civic justice? The Rev. Waltrina Middleton, whose cousin DePayne Middleton was killed at Mother Emanuel, told me that the act of forgiveness had always been fraught for black South Carolinians. There was social pressure to appear pious in front of other Christians. But there was another kind of performance — she likened it to code switching — by which black folks expressed forgiveness and contrition in their encounters with white people while reserving their real feelings for safer, private black spaces. "There was this constant need to assure white people that we are not angry, that we can live in peace with you," she said. "And that's about a need to survive ... [to] make white people not fear us." The white people of Charleston feared Denmark Vesey. They hanged him and his allies, all 34 of them, and burned their church to the ground. A violation in "The Holy City"
When you walk down the streets of Charleston, it's hard not to notice all the churches, some grand and ornate, some more stately with wide columns out front. It's the houses of worship — 400 of them in a city of just 130,000 people — that give the city its nickname, The Holy City. And as folks there told me, the question "Where do you go to church?" remains a staple of getting-to-know-you conversations. Walking around helps you understand the particular kind of violation people in Charleston felt after Roof's rampage. When I visited Mother Emanuel last week, a huge sign hanging in a school window on the other side of the street read WE STAND WITH CHARLESTON. A tall man in a black pinstripe suit was holding a cup of coffee near the front of the church, and I flagged him down. His name was Michael Salley, and he was about to give a talk to the church's women's group. I asked what he thought of the idea of forgiveness. "It's very difficult to understand the real history of America without understanding Charleston." During my time in Charleston, some locals grumbled that the city's historic tours contort themselves to avoid the ugliest details of its past. As you roll past his gorgeous, centuries-old mansion, you'll hear about John Calhoun, a favorite son and onetime vice president of the United States. But relatively little will be said about his vehement defense of slavery or his role as one of the intellectual architects of Southern secession. You might learn that the city was once among the richest in the United States, but not that this was largely due to its position as the major point of entry for enslaved Africans into America. By some estimates, more than 40 percent of all black Americans can trace an ancestor to the port of Charleston. Salley was right: It's hard to really understand America without understanding Charleston. "Unfortunately, like [in] the rest of America, there's still a lot of segregation on Sundays," Andrea McKellar told me. She is a white Episcopal ministry developer and belongs to a small church formed a few years ago that was trying to grapple more directly with issues of race. She said their church had about 50 members, and all but five are white. Her conversations about race ignited by the Roof and Slager cases had not been easy. "A lot of them seem to be surface conversations because we are not ready to acknowledge the full past," McKellar said. "Because we have been together for so long" — she meant black and white Charlestonians — "we've unfortunately been working mostly on the surface." That togetherness McKellar referred to has always been fraught. Black folks and white folks were historically separate, unequal and knotted together in complex, charged ways often perfumed by the city's famed gentility. One night, as I sat down for dinner with other reporters in town for the Roof trial, the restaurant's owner, a middle-aged white woman, spoke to us with deep affection about the "family friend" for whom the restaurant was named. She said the woman had raised her mother and had "spoiled her rotten." It didn't dawn on us until she pointed to an old, framed photo on the wall that the black woman for whom Jestine's Kitchen was named was her family's domestic help. The truth is always incomplete. That's how the city tells itself about itself when it comes to race. After Denmark Vesey was gone, the town's white leaders destroyed records of his planned uprising for fear that it would inspire more revolts — a terrifying plausibility for white South Carolinians, who were wildly outnumbered by enslaved black people. For the next 150 years, Vesey and his rebellion were essentially erased from the city's history. It took a push to have a statue erected in Vesey's honor — a campaign that was very controversial — before Charleston officially acknowledged him. The life-size statue was finally unveiled in 2014 in a public park on the west side of the city. It's easy to "speak from a distance"
On the second day of the Roof trial, I was sitting in the spacious office of Cress Darwin, the pastor of Second Presbyterian Church of Charleston. Darwin had spent the previous day in the courtroom lending spiritual support to Felecia Sanders, who survived the shooting at Mother Emanuel. Sanders lost her son, Tywanza, who was killed trying to protect other churchgoers. Another of her relatives, Susie Jackson, was also killed. Both Sanders and her granddaughter survived Roof's rampage by playing dead. She had since become a congregant at Darwin's church. It was an easy switch logistically, if not denominationally; the two churches are separated by a parking lot. Darwin's church, too, traces its history back to the 19th century. A tablet in its main entrance bears the names of church members who died fighting for the Confederacy. Darwin had heard of people who were ambivalent, even suspicious of the narrative of forgiveness that had taken root after the Mother Emanuel shooting. But he said people who felt that way misunderstood the motives of those doing the forgiving. "I can understand why people thought [the emphasis on forgiveness] might be a condition of the historic relationship; that people had been kowtowed into speaking like that out of survival," Darwin told me. "I think that's easy to speak from a distance." He had seen the grief of the victims' families up close, and he didn't think there was anything particularly easy about their decision. And it was a way of coping with their loss, he said, that would be impossible to understand for people who were less devout. "Not many people are able to do what those people were able to do — to forgive — because not many people were as immersed in their faith like those people were," Darwin said. "Church was their life, and everything else was ancillary." Darwin said that the act of forgiveness wasn't even necessarily about the person who had transgressed, but about the person who had been wronged. "It's like cleansing toxins from the body," he said. And some relatives linked to the two trials had pointedly withheld their forgiveness. "[W]e had to deal with this whole notion of forgiveness of the shooter two days after the incident, while my sister was still in the morgue," Malcolm Graham wrote last year, referring to his sister, Cynthia Graham Hurd. "I simply do not forgive. I don't think you can forgive someone for a hideous act like that two days after it occurred. Forgiveness is a journey, it's just not granted, especially when they never asked for it." Hampton Park had once been an open-air prison for Union soldiers. Nearly 260 of them died of disease, and their bodies were dumped into a mass grave behind a grandstand. When the Civil War ended, black Charlestonians dug up the bodies and gave them proper burials on the same land. But as Reconstruction gave way to the Lost Cause, the remains were disinterred and moved to the nearby Citadel military academy. The graveyard was turned into a fairground bearing the name of a former slave owner and avowed white supremacist named Wade Hampton. It was in Hampton Park where Bernie Powers, a historian at the College of Charleston, had one of his final meetings with his friend the Rev. Clementa Pinckney, who was Mother Emanuel's pastor until Roof shot him down. The meeting took place on a dreary, overcast day, two months before the massacre, and Powers and Pinckney were among those gathered in Hampton Park to commemorate the 150th anniversary of the end of the Civil War. Pinckney, who was also a state senator, had taken to the floor of the Legislature just days before to call for body cameras for the police after Slager shot Scott in the back. Pinckney, who had developed a reputation as a peacemaker, extended his concern to the officer captured on video repeatedly shooting Scott. "Our hearts go out to the Scott family, and our hearts go out to the Slager family, because the Lord teaches us to love all," he said then, "and we pray that over time, that justice be done." Powers recalled that Pinckney had been pressed into last-minute service to give the sermon at the Civil War ceremony. "In his remarks, he was very generous to Confederate soldiers," Powers said. Pinckney read a story from the Old Testament about David's son Absalom, who died fighting against his own family — a house divided. "God is not a respecter of persons nor causes," Pinckney said from the dais in the park. "And so we honor all the blood, all the troops that gave their lives during this time." It was a surreal confluence of histories in a city that remains deeply invested in the work of unremembering. Pinckney, the pastor of a black church that Charleston had once destroyed and tried to erase from memory, was doing the delicate, thorny work of reconciliation. He was extending the possibility of grace and forgiveness to men who fought and killed to keep his ancestors enslaved. And he did so as he stood in a park named for a white supremacist; a park where only a year earlier, the city erected a statue of Denmark Vesey, the preacher whose flock Pinckney now shepherded at Mother Emanuel. "And then to have him murdered by this neo-Confederate guy," Powers said, "it was unbelievable. I'll never forget that."